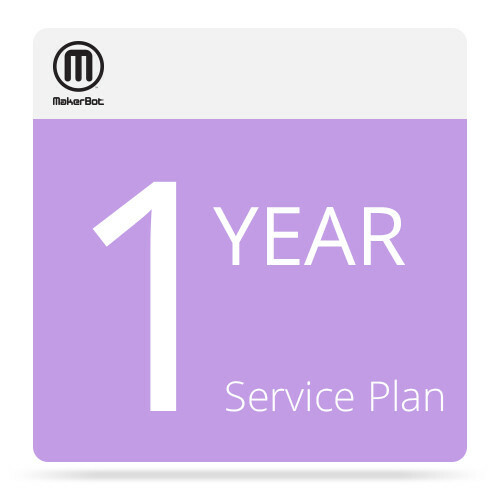 The 1-Year MakerCare Service Plan for MakerBot Replicator 2 Desktop 3D Printer from MakerBot provides one year of additional coverage. The MakerCare service plan covers one MakerBot Replicator 2. Its serial number will be tied to the the associated "MakerCare Service Plan" (MSP) number. This means only the MakerBot Replicator 2 that is registered with this MSP number will be eligible for service. MakerCare is available in the contiguous United States. MakerCare covers certain non-consumable MakerBot Replicator 2 parts when they require replacement due to manufacturer's defects or normal wear and tear. Other exclusions apply, such as damage due to accidents, loss, theft, abuse, neglect or misuse. The service plan does not cover the camera filter or the calibration tool. The service plan also does not cover damage resulting from hardware, software, firmware, or serial number modifications to the MakerBot Replicator 2. Please note that the MakerBot service plan is non-transferrable and non-refundable, except if the MakerBot Replicator 2 is returned within the 14-day return policy. In order to redeem MakerCare benefits, the original purchaser of the MakerBot Replicator 2 and the associated MakerCare service plan must contact MakerBot Support via phone, web form, or email to open a ticket. MakerBot Support will help to identify the source of the trouble. If replacement parts are deemed necessary for those parts that are covered, MakerBot Support will coordinate the shipment of your MakerBot Replicator 2. If a return is deemed necessary for proper servicing, MakerBot Support will issue you a Return Merchandise Authorization Number. Shipments must be made in the original packaging. Unauthorized returns will not be accepted under any circumstances. MakerBot will determine the method by which your MakerBot Replicator 2 is shipped back to you and will cover shipping costs. Box Dimensions (LxWxH) 5.95 x 4.45 x 0.65"